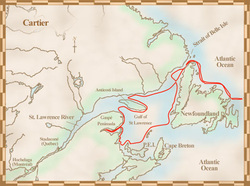 Who was this man, Jacques Cartier? What did he do and why is his name important for the early history of Canada? When did he live? When did he arrive in Canada for the first time? Did he come again? When and for which purpose? How did he travel and how important was he? Exploration led to settlement at a later time. What is the difference between exploration and settlement? This is a meeting between Cartier and the First Nations People. Who were these First Nations? What kind of relationship developed between them and Cartier? Did the relationship change and why? 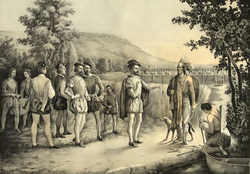 Samuel de Champlain is another important explorer in Canada's history. This painting shows him meeting Brûle. Who was this man? Please visit http://www.civilization.ca/cmc/explore/virtual-museum-of-new-france/the-explorers/etienne-brle2weeblylink_new_window for more infomation. 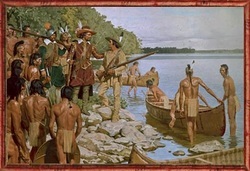 What do you think was the role of the First Nations People surrounding the two European explorers?